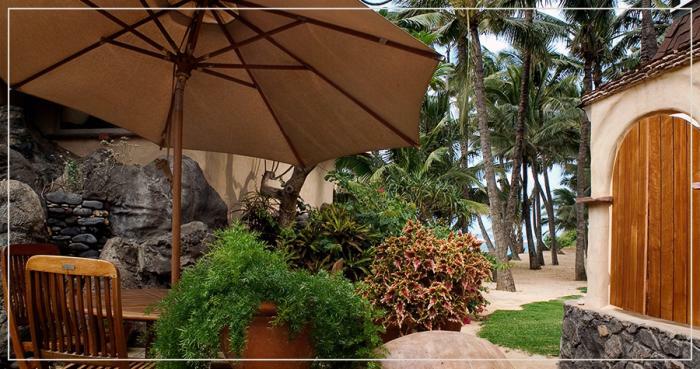 Located just steps from the ocean on a secluded white sand beach on Maui's North Shore, the Inn at Mama’s Fish House offers the same warmth and charm you'll find in the award-winning restaurant. Polynesian decor, unique local wood-working, spectacular tropical flower arrangements and beautiful artwork fill the rooms with aloha, creating a casual comfort that most dream Maui to be. Nestled in a coconut grove in a secluded beach on Maui’s north shore, away from the busy resorts that line the shores of West and South Maui. Close by is Paia, Maui’s coolest town, with shopping, galleries, cafes, night-life and the island’s biggest and best organic grocery store. The beach is next door to famous Hookipa Beach, where international wind-surfing, kite-surfing and board-surfing competitions are held.